The wonders of space are endless, but some of the most intriguing places are relatively close-by. This series brings to life the excitement of exploring our solar system. The Inside Story of the Sun takes readers on an exciting journey to the star at the center of our solar system. 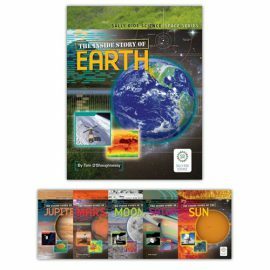 The book explains how the Sun produces energy and how that energy affects everything we do. Life on Earth wouldn’t be possible without the warmth and light that the Sun provides. The book also traces the history of our understanding of the Sun, from a time when people thought the Sun revolved around Earth to our current understanding that everything in the solar system revolves around the Sun. The Inside Story of Earth draws on the latest findings from Earth-observing satellites and decades of research to present an engaging overview of our home planet. Award-winning science writer Tam O'Shaughnessy recounts the long history of our planet and takes an in-depth look at Earth's features, from its vast oceans and thin atmosphere to the many life forms that call Earth home. The Inside Story of the Moon offers an in-depth look at our nearest neighbor in space and its important relationship to Earth. The book takes readers on a journey from the Moon’s origin shortly after Earth formed to the historic Apollo missions and then looks ahead to the possibility of a future Moon base. The Inside Story of the Moon also profiles scientists and engineers who have helped deepen our understanding of the Moon. People have long had a special interest in Mars because it is the planet in our solar system most like our own home, Earth. The Inside Story of Mars is packed with fascinating facts about Mars, from its thin atmosphere, rocky canyons, and polar ice caps to the possibility that it once had life. The book chronicles the history of our exploration of Mars and looks ahead to a time when people may walk on the Red Planet. The Inside Story of Jupiter draws on information and images sent back by a series of space probes to present an engaging overview of the largest planet in our solar system. Readers ride along on a tour of Jupiter, from its colorful stormy atmosphere to its many moons, including icy Europa, with a salty ocean inside. Included are profiles of scientists who are working to learn more about this amazing giant planet. For centuries, people have wondered about Saturn—a golden planet circled by graceful rings. The Inside Story of Saturn draws on decades of research and the finding of space probes to paint a vivid portrait of the ringed planet. The book explains what Saturn’s stunning rings are made of and tells what we have discovered about the plant’s swirling clouds and medley of moons, including Titan, with its thick orange atmosphere and wet, oily surface. The wonders of space are endless, but some of the most intriguing places can be found right in our own solar system. The Inside Story of the Solar System is a six-book series that brings to life the excitement of exploring our solar system’s star, planets, and moons. Each book tells what we know about a particular body in our solar system today and what we hope to learn in the future. The science of our solar system is so fascinating that it makes fiction seem dull! View individual titles for details on each book.